How does Alpha-Stim cranial electrotherapy stimulation (CES) technology work? The exact mechanism by which Alpha-Stim produces effects is not fully known. However, based on previous and ongoing studies, it appears that the Alpha-Stim microcurrent waveform activates particular groups of nerve cells that are located at the brainstem. These groups of nerve cells produce the chemicals serotonin and acetylcholine which can affect the chemical activity of nerve cells that are both nearby and at more distant sites in the nervous system. In fact, these cells are situated to control the activity of nerve pathways that run up into the brain and that course down into the spinal cord. By changing the electrical and chemical activity of certain nerve cells in the brainstem, Alpha-Stim appears to amplify activity in some neurological systems, and diminish activity in others. This neurological ‘fine tuning’ is called modulation, and occurs either as a result of, or together with the production of a certain type of electrical activity pattern in the brain known as an alpha state which can be measured on brain wave recordings (called electro-encephalograms, abbreviated EEG). Such alpha rhythms are accompanied by feelings of calmness, relaxation and increased mental focus. The neurological mechanisms that are occurring during the alpha state appear to decrease stress-effects, reduce agitation and stabilize mood, and regulate both sensations and perceptions of particular types of pain. These effects can be produced after a single treatment, and repeated treatments have been shown to increase the relative strength and duration of these effects. In some cases, effects have been stable and permanent, suggesting that the electrical and chemical changes evoked by Alpha-Stim have led to a durable re-tuning back to normal function. Electromedical Products International, Inc. is dedicated to continued research into the mechanisms and effects through which Alpha-Stim can be beneficial to patients with pain, anxiety, depression and sleep disorders. 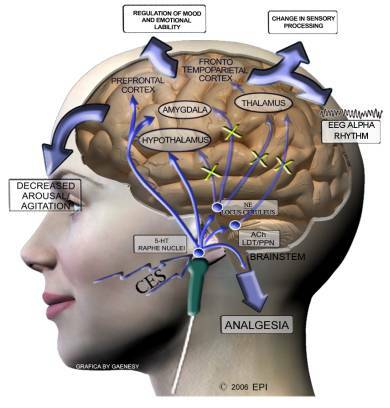 Alpha-Stim CES engages the serotonergic (5-HT) raphe nuclei of the brainstem. 5-HT inhibits brainstem cholinergic (ACh) and noradrenergic (NE) systems that project supratentorially. This suppresses thalamo-cortical activity, arousal, agitation, alters sensory processing and induces EEG alpha rhythm. As well, 5-HT can act directly to modulate pain sensation in the dorsal horn of the spinal cord, and alter pain perception, cognition and emotionality within the limbic forebrain. James Giordano, Ph.D. is a UNESCO Fellow and Scholar in Residence at the Center for Clinical Bioethics, Georgetown University Medical Center, Washington, DC. Dr. Giordano is also Visiting Scholar at the Center for Ethics, Dartmouth Medical School, Hanover, NH, and Invited Lecturer at the Roundtable in Arts and Sciences, Oxford University, UK. As a neuroscientist, Dr. Giordano's ongoing work is focused upon neural mechanisms of pain, the philosophy of pain research and practice of pain medicine, and the neuroethical issues inherent to the development and use of emergent technologies in neurology and psychiatry. Dr. Giordano received his Ph.D. in biological psychology from the City University of New York. He was a NIEHS post-doctoral fellow in neurotoxicology and neuroscience at The Johns Hopkins University, Baltimore, MD, served as Visiting Scientist in the Department of Clinical Neuropharmacology, Max Planck Institute for Psychiatry, Munich, Germany, was an American Psychological Association Visiting Fellow in neuroimaging at the Martinos Center for Advanced Imaging, Harvard University Medical School/Massachusetts General Hospital, and completed post-graduate training in bioethics at the Neiswanger Institute for Bioethics and Health Policy, Loyola University/Stritch Medical School, Chicago, IL. The author of over 65 refereed publications on pain, ethics and medical philosophy, Dr. Giordano serves as Neuroscience Section Editor for the Pain Physician journal, Bioethics Editor for the American Journal of Pain Management, and Ethics Section Editor for the journal Practical Pain Management.